A healthy grain free chickpea pasta salad with cherry tomatoes, arugula, and a nut free nutrient dense pesto sauce; ready in 15 minutes! I can’t believe that it is almost DECEMBER already!? Looking back over the last few months, I can’t even remember what I did, and I am constantly wishing time would slow down- just a bit! I am always a bit anxious for the holidays. They are chaotic, a bit stressful, and the busiest time of the year. More often than not, I have a harder time keeping up with my exercise routine, sleeping takes a back seat, and there always seems to be an abundant amount of food or holiday parties to go to! I mean, don’t get me wrong, I LOVEthe holidays – Christmas is my absolute favorite, the snow, food, the holiday movies, spending time with family- just everything about it….plus my birthday is just a few days after the New Year. But I just have a harder time saying no to social events or trying out new holiday desserts, or simply taking a time out for myself. With that being said, I try to set a few mini goals each week; meal prep on Sundays, sign up for a few morning workout classes ahead of time, and not feel guilty if I have to say no to certain things - when I sleep and eat better, I feel SO much better. I am more productive during the day, less anxious, and I have more energy. Anyone else? This week, I prepped a super delicious Barilla®Chickpea Casarecce pasta with pesto, arugula, cherry tomatoes and roasted brussels sprouts. Maybe the best part about this dish is that the entire thing can be prepared in less than 15 minutes from start to finish. 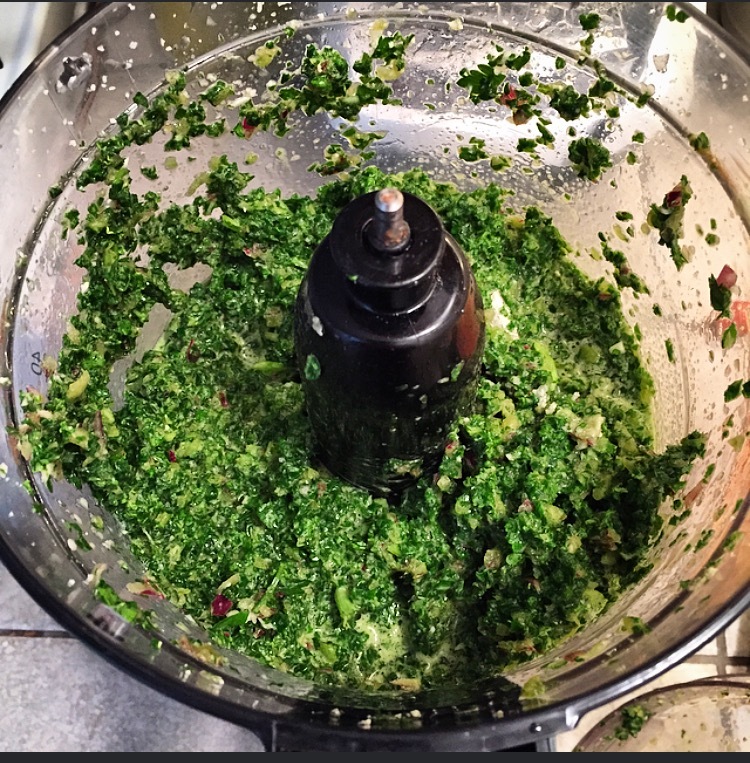 The homemade pesto is nut free, nutrient dense, and so addicting! I think that pasta and pesto is my favorite combination…it always feels light but really satisfying. I love how the pesto gets stuck in every nook and cranny of the Chickpea Casarecce. When I want pasta, I look for those that are made with legumes and include only real, simple ingredients; legume pastas feel better on my body, provide plant-based protein, and are gluten free! Luckily, Barilla recently launched a line of legume pastasthat comes in four varieties: Chickpea Casarecce, Chickpea Rotini, Red Lentil Penne and Red Lentil Rotini. The best part is they are made with justONE simple ingredient; no gums, no fillers, just chickpea or red lentil flour. Barilla has been my favorite brand of pasta and a staple in my home since I was a kid. I feel grateful that they have these options available now. It truly is a healthy option and the perfect plant-based fuel. I love to cook enough pasta for the week and each time add in something different; veggies, red sauce, homemade veggie burgers; really just about anything. With this recipe, I wanted to keep it simple. Just 15 minutes and you’re done. Full of protein, dairy free, plant-based, grain-free and something that you can enjoy hot or cold! Also, it kind of has a holiday feel to it; reds, greens…it would make the perfect side dish for any party! The pesto is simple to make, too, and you’ll have leftovers to add into salads, spread on toast, or sprinkle over roasted vegetables. I decided to make this pesto nut free, dairy free (of course! ), and with minimal ingredients. I actually didn’t even use basil for the recipe, instead I used arugula. That way, you do not have to waste any ingredients and can use them interchangeably, and it gives the pesto extra nutrients and a peppery taste. After the Barilla Chickpea Casarecce is finished cooking, you will need to drain it, then pour it into a big serving bowl. While still warm, add the prepared pesto, chopped cherry tomatoes, fresh arugula (& any roasted veggies if you want! ), and mix everything until well combined. It can be served warm or cold and lasts up to a week in the fridge! In a large pot, prepare the pasta according to the directions. While the pasta is boiling, prepare the pesto sauce and the vegetables if using. You can either quickly cook the vegetables over the stove top with olive oil until tenders or roast in the oven. In a food processor or blender, add the pumpkin seeds and the chia (or hemp) seeds. Blend until you have reached a fine consistency. Add the arugula and the remaining ingredients EXCEPT the olive oil. Blend until combined (1-2 minutes). Add the olive oil and pulse until well combined. If the pesto is feels too dry or not to your liking, slowly add more olive oil. Set the pesto aside. Chop the cherry tomatoes. Drain the pasta and add to a large mixing bowl with the cherry tomatoes, 2 handfuls of arugula, roasted or cooked vegetables of choice and 1/2 cup of the pesto to start. Mix until well combined. Adjust to your needs! For the pesto, you can sub any seed or nut of choice as long as it equals 2 cups. You can replace the arugula with the same amount of basil if you prefer. 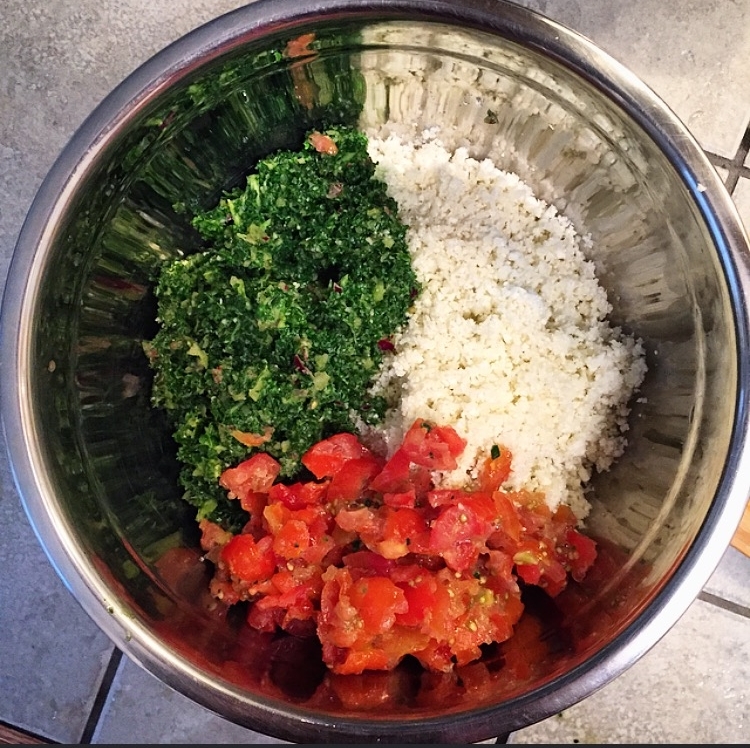 The addition of nutritional yeast in the pesto will give the pesto a “cheese” taste; completely dairy free. I love a good potato salad, it's so comforting, creamy, honestly it's simple to mix together, and reminds me of summer- BBQ's especially! It's the perfect side to bring to any BBQ because it goes with everything! EXCEPT, I love sweet potatoes, Japanese Yams in particular, vs. regular ones and I prefer a lighter yet creamy mustard dressing vs. your typical mayo based dressing that you would find. So, for this recipe, I changed things up. I also wanted to make this salad a little more gut friendlier and healthier! Not only do sweet potatoes have anti-inflammatory properties, but they have a higher fiber content than regular potatoes and are easily digested! They are soothing for your stomach and your gut! I also added in Vital Proteins Bone Broth Collagen both to the mustard vinaigrette dressing as well as the water the sweet potatoes were boiling in! I've talked so much about my gut health issues on my blog (here) with SIBO & leaky gut and drinking bone broth on the regular is a staple in my diet for healing my gut as well as helping to restore its' lining. I've found that the more I drink bone broth and use collagen, the stronger and better my digestion is and I feel that my stomach is less inflamed! Not only does bone broth help sooth your digestive track, and help with growth of probiotics in your gut, but its great for healthy joints, stronger hair and skin health! Plus, bone broth collagen easily dissolves in the mustard vinaigrette dressing and it is tasteless! You can see how I've incorporated their Marine Collagen, into a breakfast recipe, when I made this cacao oatmeal bake with a cashew cream here! Back to the recipe... I prefer to boil the sweet potatoes instead of roasting them, because they become so soft, but you are still left with a little bite. Plus, when you add the creamy dressing to the mix, the dressing seeps into the potatoes so much more fluidly and bits break off too. It almost becomes melt in your mouth! You can certainly roast the potatoes, but honestly, it is faster and less complicated to boil them, add to a large bowl and toss with the tangy dressing! I tend to also stick with Japanese Yams because I find them a little less sweet than the others. There are just a few steps to this recipe, boiling the potatoes, the eggs, and making the dressing, but it is worth it and quite simple as you can practically do them all simultaneously! It is worth it. For the sweet potatoes: prepare first. 1. In a large pot (one that will fit all 4 of the potatoes or use two pots), bring the water to a boil. Add 1 packet of the Vital Proteins Bone Broth Collagen. It will dissolve completely in the water. Next, add the potatoes so they are completely covered by the water. Bring the temperature down to medium. 2. Boil the sweet potatoes for roughly 30 minutes. You want the sweet potatoes to be cooked, tender, yet still a little firm to touch. You can check by sticking a fork through. See notes. 3. Once the sweet potatoes are finished, remove them from the water and allow them to cool completely before you cut them. I stick them in the fridge to speed up the process. 4. While the sweet potatoes are boiling, boil the eggs. In a smaller pot, bring the water to a rapid boil. Then, turn the temperature to medium heat, carefully add the eggs to the water and boil for 12 minutes. Immediately place them in a bowl filled with cold water to stop the cooking process. Set aside. Allow to cool. 5. Chop the celery and the scallions. Set aside. 1. Add all of the ingredients into a mason jar (easier to shake up) or a bowl and whisk together! Taste test. Adjust to preference. 1. Once the sweet potatoes have cooled, slice them in half the long way and cut them into chunks. I left the skin on, but feel free to peel the skin off. 2. Peel the egg shells and slice the eggs. 3. Add the sweet potatoes, the eggs, chopped celery, chopped scallions, sea salt, pepper, as well as the dressing to a large bowl and give it a good mix, until well combined. Serve cold. The dressing will be on the thicker side. I prefer it this way and makes the sweet potato salad a little on the creamier side, but if you prefer it to be a thinner consistency, start by adding a small amount of warm water to the mixture. However, you do not want it to be extremely thing or you will have a pool of vinaigrette at the bottom of your sweet potato bowl. Note that this is more a thicker dressing vs. your regular salad dressing. 1. I allow the sweet potatoes to completely cool before I slice them into pieces because I find it to be easier. You can skip this step. Some people like to add the dressing while the sweet potatoes are still warm, but I find that the dressing sticks better when the sweet potatoes are cold! Totally up to you! 2. Make sure you do not over boil the potatoes or they will be mush! You want them to be firm to touch, yet cooked all the way through. Mine were perfect after about 30 minutes. I checked after 25 minutes, so it will depend on the size and thickness of your sweet potato. 3. You can use any sweet potato you prefer, I just love the taste of Japanese Yams. 4. You can also add in any additions to the salad or leave out any that I did! If you do not have the Vital Proteins Bone Broth Collagen, you can omit it but it has amazing benefits! 5. It will last up to a week or so in the fridge, but I promise you will finish it within a few days! So addicting! This creamy cold pasta salad filled with veggies and a healthy dressing is so perfect for your next summer BBQ! One of my favorite things to eat when I was younger was this cold pasta salad that my mom used to make. I loved taking it to the beach in the summer or having it at BBQ as a side dish with a hot dog. Hot dogs over hamburgers; always. It was so simple to make, creamy, and tasted even better the longer it would sit in the fridge and marinate in the homemade dressing. When Sir Kensingston's sent me their new Fabanaise Vegan Mayo, I knew exactly what I wanted to re-create! For this recipe I also used my favorite pasta, Banza, which is also made from chickpeas. So if you are totally chickpea'd out from the mayo, feel free to use your favorite macaroni pasta! I love using shells or elbow pasta for these types of dishes and prefer to cook the pasta a little al dente. I find that if I over cook the pasta it tends to fall apart after it has been marinating in the dressing in the fridge after a few days. I chose to add some greens in the pasta salad such as spinach, green beans, and zucchini, but you can really dress it up to your preference or leave them out all together! I just think it gives the dish a nice balance- little pasta and a little bit of greens- makes it into a meal if you wanted it! The dressing is very simple as well. I used the mayo and added in a few simple ingredients such as sea salt, pepper, mustard, lemon etc. and it created a sweet and tangy flavor. It was actually light, refreshing, and didn't take away from the pasta or the veggies! The whole dish can be ready in less than 15 minutes and even be made ahead of time before you head off to a summer get together or is perfect for Sunday night meal prep! Total time: less than 15 minutes! 1. Cook the pasta according to directions. Do not over cook the pasta or it will break apart once you add the dressing. You want it to be a little al dente. 2. While the pasta is cooking, bring 3 cups of water to a rapid boil in a small pot over high heat. Add the the string beans and diced zucchini to the pot and cook for roughly 4-5 minutes. I prefer mine to be a little on the crunchy side; you want to essentially blanch the green beans and lightly steam the zucchini. Drain & set aside. 3. While the pasta + vegetables are cooking, prepare the dressing. Whisk all over the dressing ingredients together. Taste test & adjust according to your preference. It will be on the creamier side. 4. Drain the pasta and allow to cool for a few minutes. 5. In a large bowl, add the pasta, the spinach, raw carrots, zucchini, string beans and the dressing. Mix well until incorporated. Add more seasoning if needed. The pasta salad will keep in the fridge for up to a week! Serve cold. I am convinced that chickpeas are one of the most craziest beans out there....think about it...out of chickpeas you can make hummus, raw cookie dough (yes! ), falafels, to a hearty sandwich filling like this recipe I am going to share, and so many other delicious dishes from savory to sweet just from this one bean! This avocado cranberry walnut chickpea salad sandwich is so satisfying! I love making big batches of this on the weekends to have enough to last me through the week for a quick lunch for work, or scoop a big spoonful on a salad or plain as a dip with my favorite crackers! It is a little sweet from the cranberries, crunchy from the walnuts and celery, savory from the cracked pepper and avocado and refreshing from the apple chunks! The texture is just right too. I didn't mash the chickpeas completely with the avocado because I wanted it to have a bit of a chunkier bite to it! Speaking of avocado, that is what I decided to use instead of a mayo, so it is perfect for those who are despise all things mayo- based. I feel like you either love it or hate it! Personally, I don't mind it, but I just thought this salad and the flavors would be balanced so much better with the richness from the avocado. The avocado is also key here because it holds everything together! If you do decide to make this a few days in advanced, you can squeeze a little lemon juice over the salad to keep the avocado from browning. I also paired the chickpea salad with sweet pea greens from organicgirl! The greens added such a light and crisp flavor to the sandwich. It was the perfect addition in building the sandwich because it added a hint of sweetness too and the sweet pea shoots gave the sandwich an extra crunchy texture! I always need a crunch...when I was younger I used to put salt & vinegar chips in my sandwiches...so good! You can also ditch the bread completely and just eat the avocado cranberry walnut chickpea salad over the bed of sweet greens and I promise you it is just as good! From start to finish it will only take you ten minutes so you have no excuse to not have a healthy hearty lunch or quick dinner! 1. Rinse and drain the chickpeas. You can remove their shell or leave them on. Place the chickpeas on a paper towel and pat dry. 2. In a medium bowl, add the chickpeas and the entire avocado. Mash with a potato masher or a fork until desired texture. I like to leave the chickpeas a little chunky. 3. Add the cranberries, walnuts, green apple, scallion, celery, sea salt and pepper. Give it a good mix with a spoon or the masher. Taste test. If you prefer it to be on the sweeter side, add a touch of maple syrup. 4. Spread on bread of choice and pair with Organicgirl sweet pea greens! Store in an air-tight container in the fridge for up to five days as the avocado will start to brown. It also makes spread or dip for crackers and veggies! Honesty I was a bit mind blown after making this recipe: A vegan "tuna" salad. Huh? I know. I am not really into tuna sandwiches or just canned tuna in general. Maybe it's the fishy smell that never seems to wash off your hands or what, but it just doesn't do it for me. BUT, one of my favorite juice places here in Boston, Cocobeet, makes a "walnut un-tuna sandwich" and it is hands down one of my favorite items on their vegan menu. I've been meaning to re-create their recipe even though I have no idea how they do it! All of the flavors and ingredients that I used combined with the almonds strangely resembles a tuna salad, but the added crunch from the almonds makes it hundred times better. If you despise mayo you can certainly omit the condiment. I would then suggest replacing it with olive oil or soaking the almonds overnight. Soaking the almonds over night will result in a creamier & chewy texture. I haven't tried it this way because I used sprouted almonds and preferred the mix to be on the crunchier side. Not only are sprouted almonds better for you, easier to digest, but they are already creamier than ones that aren't sprouted, so you won't necessarily have to soak the almonds over night to get that texture. If you loved my Cauliflower Tabbouleh Salad or Chickpea Salad you will love this! I love to add the almond "tuna" salad on crackers, cucumbers, celery sticks, in a warm pita or right out of the bowl! It is perfect to make ahead on the weekends for quick easy lunches or mid afternoon snacking! *For the dairy- free mustard I love "Just Mayo" or Earth Balance Mindful Mayo Organic. Add the sprouted almonds to a food processor for a few minutes; until finely chopped or depending on the texture you desire. Add the chopped almonds to a mixing bowl. Add the celery and scallions to the food processor and pulse until chopped. Add to the mixing bowl with the almonds. Add the remaining ingredients to the bowl and stir to combine! Adjust to taste if needed. Simple as that! I like to serve mine chilled. You can do this by placing it in your fridge for an hour. Serve the salad with veggies, pita or make it into a sandwich. Since I do not eat meat, chickpeas have become a staple in my diet. Just 1 cup of chickpeas has about 14 grams of protein and 12 grams of dietary fiber in just 1 cup...this statement is for all those who think that I must be on the verge of starvation and malnourished eating a plant-based diet. This recipe is so versatile that you will never become tired of making it! The options for the seasonings and the add-ins are endless! The texture of the salad reminds me of a tuna or egg salad, so it is perfect for those who follow a vegan or vegetarian lifestyle. I like to prepare this salad on Sundays, as it will last the entire week, stored properly in the fridge. It is great between bread for a hearty and filling sandwich or is perfect over a salad with olive oil and lemon as the dressing! Drain and rinse the chickpeas and mash in a large bowl with either a fork or potato masher. Mash the chickpeas to your preference. I like to have about half of the mixture mashed as it gives the salad more substance. Add the wet ingredients. The mayo, dijon mustard, apple cider vinegar and juice of a lemon. I tend to not measure things exactly when I am in the kitchen so I would recommend starting off with about a spoonful of the mayo and mustard, taste testing as you go. Give it a quick mix. Add the walnuts, carrots, celery, and apples to the bowl and give the salad a mix, mashing it a few times. Lastly, add the spices: cumin, paprika, cayenne pepper, salt, and pepper. Feel free to adjust with different seasonings at this point as well with measurements. I tend to add more of each in the salad, but its completely up to your taste buds! After I add the spices, I mash all the ingredients a few times until well incorporated and adding more seasoning if necessary. The more wet ingredients you add the creamier the salad will be. At this point I usually finish off the salad with a little smoked paprika and a dash of sea salt then grab a fork and dig in! It will last for about a week in the fridge. Chickpeas are a staple in a plant based diet and I am sure you have most of the ingredients used in this recipe on hand, allowing you to make a quick meal when you are in a pinch or if your body is craving protein! It reminds me a egg or tuna salad. It is full of protein, flavor and fiber! I typically serve this over a bed of greens such as arugula, with crackers, or in between bread with avocado slices, spinach, and tomatoes for a hearty filling sandwich. In a large mixing bowl add the rinsed chickpeas. Mash the chickpeas with either a fork or potato masher. At this point you can mash the chickpeas to your preference. I tend to leave chunks in mine for a bit more texture. Add the remaining ingredients and optional add-ins and give it one more good mash. If you decide to add the hummus or vegan mayo you will have a creamier texture, one that is easily spreadable on toast. Feel free to adjust the spices to your preference as well. You could use curry powder, garlic powder, etc. The options are endless! Serve! Will last for about a week in the fridge in an air-tight container. As someone who does not eat meat, my meat eater friends always seem to think that I must be lacking protein and constantly starved. I think that it is a common misunderstanding that those who follow a plant-based diet are unable to intake the necessary amount of protein for the body to properly function. Little do people realize that some of the best sources of protein are found in leafy greens (think spinach) & legumes (think chickpeas)- exactly what this salad is packed with. I am confident that a meat eater will feel satisfied after this dish; full, but not to the point of feeling sluggish since it is filled with so much wholesomeness. The aroma of the spices cooking with the onions are stimulating and the juiciness of the mangoes paired with the crunchy spinach and charred cauliflower create the perfect bite of flavor and texture. I love preparing this type of salad the night before for lunch as it is fills me up to give me the energy I need for the rest of the day; avoiding the 3PM slump! It is quick to make, refreshing, and delicious! It is great either warm or cold and will last for a few days stored properly. *Feel free to adjust the above spices to taste. I usually over load my dishes with spices, the above measurements are reserved, so I suggest to up it! I tend to not measure exactly and taste test as I go. Rinse the chickpeas and set aside. In a pan, over medium-high heat, add 1 tablespoon of coconut oil. Add the sliced onion and cook for 5 or so minutes, string occasionally. Add the spices to the mix (salt, cumin, turmeric, curry) and cook for another 5 minutes. Stir occasionally until the onion becomes translucent. Add the chickpeas to the pan and mix until well-incorporated. Set aside off of heat & transfer to a large mixing bowl. In the same pan, heat 1 tbsp. of coconut oil over medium heat. Add the cauliflower and a dash of salt. Add 2 tbsp. of water. Cover the pan and steam for 5 minutes. Remove the cover and turn the heat to medium high. Cook the cauliflower until it is browned and almost charred-like. Add cauliflower and the chopped chili to onions and chickpeas; stir well. Adjust to taste. You can either add the spinach and mangos to the mixing bowl and stir until well mixed or you can dress your plate first with the spinach and top it off with the cauliflower, onion, chickpeas, and mangos. I like to add everything to the mixing bowl, add the lime juice and a little salt. That way everything is well incorporated and the flavors are more balanced. Finish the dish off with cilantro. Serve as is, cold, or room temperature. Quinoa is a great protein source for vegetarians and vegans. Roughly 1 serving (1 cup) has 24 grams of protein!! I am always looking for ways to incorporate this grain into my meals to make sure that I am eating enough protein throughout the day. For this particular recipe, I decided to cook the quinoa in vegetable stock instead of water. I realized that the stock adds a tremendous amount of flavor and really brings out the the other ingredients in the dish. Allowing the cranberries to soak in the quinoa and vegetable stock while it is simmering over the stove really enhances the flavor of the entire meal and because of this, the quinoa salad did not need a dressing, salt, or any other spice to add flavor! I decided to pair the quinoa with cranberries because it balances out the nuttiness and pairs well with the tartness of the kale, added a sweet element to the meal. Feel free to substitute with raisins or even dates. This dish makes a great main dish as it is packed with antioxidants, vegetables, protein, and fiber, but can also be enjoyed as a side! It also keeps well the next day making it the perfect lunch. Over medium high heat add 1 tablespoon of coconut oil. Add the almonds and stir continuously until the almonds brown. Roughly 5 minutes. Be careful not to burn the almonds. Set aside, away from the heat. Heat 1 tablespoon of coconut oil in a pot over the stove. Add the minced garlic and cook until tender. Roughly 4 minutes. Add the cranberries and the quinoa to the pan and mix well. Once incorporated add the vegetable broth. Mix well. Bring to a boil. Once boiling, reduce the heat to a simmer. Cover and allow to cook for 20 minutes. Once the vegetable stock has been full absorbed, add the torn pieces of kale. Mix over the heat (turn down to low) until the kale has become tender and wilted. This will only take a few minutes. Add the almonds and stir. When you are ready to serve, top with the pumpkin seeds. This dish can be served either warm or cold. This dish is great for the summer months and makes the perfect addition to any meal or eaten as a main and even lunch! Even though, the meal is light and refreshing, I often times have something like this during the winter months. Our bodies may be craving comfort foods that are warming and filling. However, these meals can often leave us feeling a bit sluggish and zap our energy. When I find myself missing workouts and moving less throughout the day due to the long winter days, I tend to gravitate towards lighter and more refreshing meals to refuel my body and restore the energy that has been lost. This raw cauliflower tabbouleh salad will give your body and digestive system a break from the heavier stews and dinners that your body has become accustomed to. Cut the cauliflower into bite sized pieces and add to the food processor. Pulse until "cauliflower rice" has formed. Roughly 2 minutes. Set aside in a bowl. Remove the stems from the parsley and kale (or spinach). 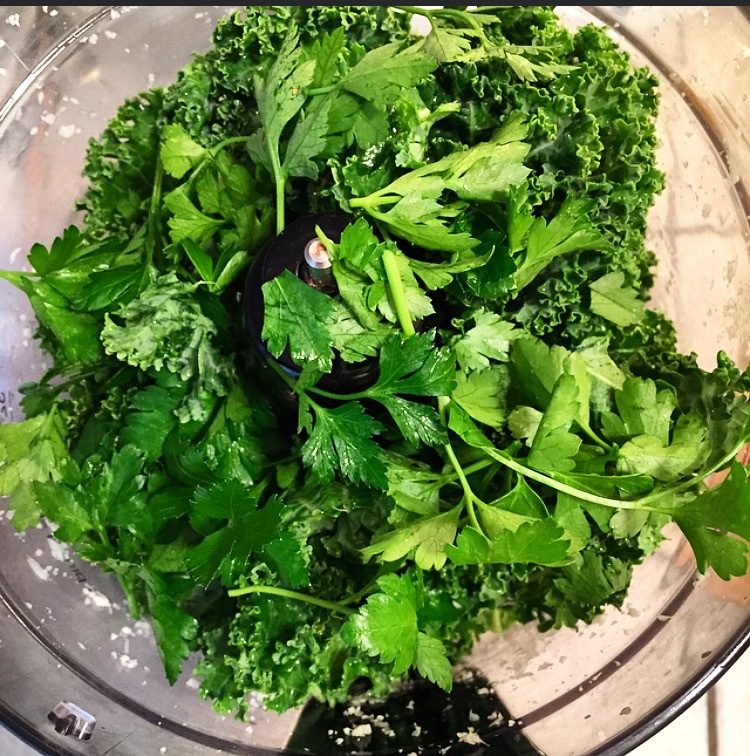 In the food processor, pulse parsley and kale leaves with diced onion, juice of 1 lemon, salt, pepper, cumin, and olive oil until well combined. Taste test the mixture and adjust to your taste. Add to a large mixing bowl. Add the cauliflower to the mixing bowl. Here, you can either add the cherry tomatoes whole or quickly add to the food processor and pulse until chopped. Add the tomatoes to the mixture and with a wooden spoon, combine. At this point the dish is complete! You can adjust to your taste and drizzle the juice of the second lemon before serving. I usually pair mine with hummus & toast! The tabbouleh will last in an air tight container for a few days. This recipe proves that salads do not have to boring! This is a great light and healthy salad option after an indulgent weekend or to get you back on track! I served this salad with a honey red wine vinegar dressing that pairs perfectly with the sweetness of the potatoes and balances out the tartness and richness of the tomatoes and avocados. The sweet potatoes will help fight inflammation and the spinach and pine nuts are a great source of dietary fiber, energy, and antioxidants. Preheat the oven to 400. Place the peeled/cut sweet potatoes and the halved tomatoes on a lined baking sheet tossed with salt, pepper, and 1-2 tablespoons of olive oil. Bake for 30-45 minutes or until the sweet potatoes are tender. On medium high heat on the stove top, add 1 tablespoon of olive oil (or coconut oil). Once warm, add the pine nuts. Cook for 1-2 minutes or until they start to brown. Be careful not to burn; mix continuously. For the dressing, whisk together the ingredients in a bowl. To prepare, place the above ingredients over a bed of spinach and serve immediately with dressing. * Adjust all to taste. I usually start off with smaller amounts and add as I go. Pre-heat oven to 400 degrees. Line a baking sheet with parchment paper and set aside. Wash and dry the sweet potato. Cut into desired size. In a bowl, add the sweet potatoes, and drizzle with olive oil (evenly coated 1-2 tbsp. ), salt, pepper, and any other spices of preference. Place in the oven and bake until golden brown; usually 40 minutes. Check every 10 to 15 minutes and toss the sweet potatoes so they can cook evenly. Cut the carrots into 1 inch long sticks. You can toss the carrots in the same bowl that you used for the sweet potatoes and dress with salt, pepper, olive oil, and other spices (cumin, paprika, cayenne pepper etc). You can place the carrots on the same backing sheet as the sweet potatoes and cook until they are caramelized. Roughly 40 minutes. Cook the quinoa according to directions. Most directions call between 15-20 minutes. Wash and dry the kale. On the stove top over medium heat add 1-2 tbsp. of either olive oil or coconut oil to the pan. Tear the kale into bite sized pieces and cook until tender- 5 or so minutes. Set aside in pain away from heat. While the sweet potatoes and carrots are roasting and the quinoa is on the stove. Make the dressing. In a bowl combine all of the ingredients and whisk. Adjust to taste. Once the carrots, sweet potatoes, and quinoa are finished add to the pan with the kale. Mix well. Add the dressing to the pan and mix well. Serve! I like to double or triple the recipe so I have plenty of leftovers for the week. It can really come in handy on nights that you do not have time to prepare a dinner or perfect for next days lunch!